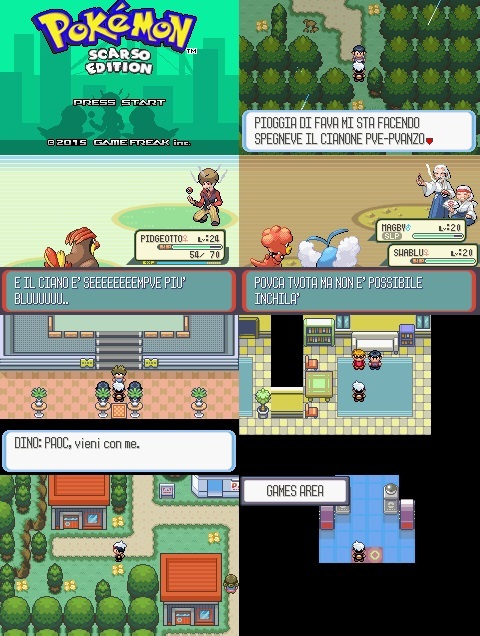 Pokèmon Scarso Edition è un’hack ironica (non parodica) che usa un linguaggio a volte sfondando i limiti della decenza, nella giusta quantità e spesso e volentieri usa un sarcasmo sadico ma bilanciato, prendendo in giro la nostra quotidianità e molto altro. (Google Translated) More than a year ago came the first version of this game made by me and Zeppho, however, I did not show changes in graphics, scripts and stuff; I therefore decided to take up the project and modify it almost completely. So BOOOM, here is the new version of Poor Edition. Pokemon Poor Edition is un’hack ironic (not parody) that uses language sometimes breaking through the limits of decency, in the right quantity, and often uses a sadistic sarcasm but balanced, making fun of our daily life and much more. Long after the project is also added the Doctah, thanks to which we have added some new soundtrack and things cosose. More than a year ago came the first version of this game made by me and Zeppho, however, I did not show changes in graphics, scripts and stuff; I therefore decided to take up the project and modify it almost completely.